© 2015, Feline Features LLC. ARLINGTON, VA, January 8, 2015 – Today, PBS KIDS launched The Tree Problem, a new app based on its series for preschoolers PEG + CAT, now available for iPad. 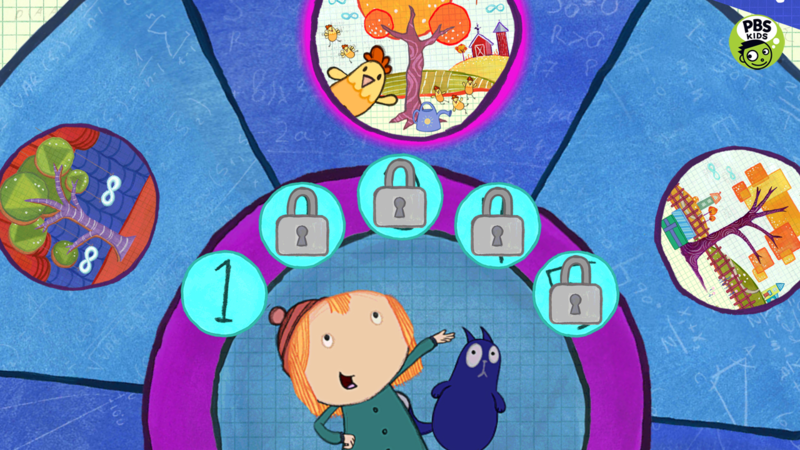 PEG + CAT follows Peg and her sidekick Cat as they embark on adventures, solve problems and learn foundational math concepts and skills. Designed for kids ages 3-6, The Tree Problem extends the series’ preschool math curriculum through a new series of games in which players help Peg get Cat out of a tree in a variety of different locations from the show. -30 total levels: Cat sure has a knack for getting stuck in trees! Levels of increasing challenge motivate children to practice key early math concepts and skills. -6 worlds: Grow plants on the farm, roll and stack snowballs at the South Pole and arrange set pieces on Broadway! Each world offers new levels, giving children a variety of opportunities to solve the problem. -Curriculum focus: Peg and Cat’s spirited and playful antics engage children in learning foundational math concepts like spatial reasoning and measurement, practicing persistence and having a totally awesome time doing it! PEG + CAT was created by Jennifer Oxley and Billy Aronson and is produced by The Fred Rogers Company. PEG + CAT was originally funded in part by the U.S. Department of Education through the Ready To Learn Initiative, a program that supports the development of innovative educational television and digital media targeted at preschool and early elementary school children and their families, as well as by the Corporation for Public Broadcasting (CPB). The Tree Problem App is part of PBS KIDS’ ongoing commitment to helping kids build the skills they need to succeed in school and in life. PBS KIDS, the number one educational media brand for kids, offers all children the opportunity to explore new ideas and new worlds through television and digital media, as well as community-based programs provided through local public media stations. PBS KIDS offers more than 40 educational apps for children, many of which are made available for free to families in low-income communities through the PBS KIDS Mobile Learning Program, a national outreach effort in collaboration with PBS stations that distributes free app download codes to community-based organizations. The Tree Problem App is available for $2.99 on the App Store for iPad or at www.AppStore.com/PBSKIDS. Images of The Tree Problem can be found on PBS PressRoom. The Corporation for Public Broadcasting (CPB), a private, nonprofit corporation created by Congress in 1967, is the steward of the federal government's investment in public broadcasting. It helps support the operations of more than 1,400 locally-owned and operated public television and radio stations nationwide, and is the largest single source of funding for research, technology, and program development for public radio, television and related online services. The Ready To Learn Initiative is a cooperative agreement funded and managed by the U.S. Department of Education’s Office of Innovation and Improvement. It supports the development of innovative educational television and digital media targeted at preschool and early elementary school children and their families. Its general goal is to promote early learning and school readiness, with a particular interest in reaching low-income children. In addition to creating television and other media products, the program supports activities intended to promote national distribution of the programming, effective educational uses of the programming, community-based outreach and research on educational effectiveness. The company was founded by Fred Rogers in 1971 as the non-profit producer of Mister Rogers’ Neighborhood for PBS. In the years that followed, it not only created hundreds of episodes of this much-loved program, but also extended Fred’s values and approach to other efforts in promoting children’s social, emotional and behavioral health and supporting parents, caregivers, teachers and other professionals in their work with children. The Fred Rogers Company continues to build on Fred’s legacy in innovative ways through a wide variety of media, and engaging new generations of children and families with his timeless wisdom. The company’s highly-rated, award-winning children’s series include Daniel Tiger’s Neighborhood, Peg + Cat and Odd Squad. For more information, visit www.fredrogers.org.